1. What does "Lucha Libre" mean? The words "lucha libre" in Spanish literally mean "free fight." The name has come to stand for Mexican professional wrestling, which is similar in many ways to professional wrestling in the U.S. The idea with the phrase "free fight" is that there are few official rules and few limits to the amount of violence allowed in the ring. 2. What is a "luchador?" In Spanish, "luchador" means "fighter." In the context of lucha libre-style wrestling, a luchador is a wrestler. 3. Why do lucha libre wrestlers wear masks? What are the masks all about? They're super cool looking, right? The idea seems to be that the mask helps create the character that the luchador portrays. In a way the mask transforms the person wearing it from an average Joe to a larger than life figure who exemplifies the special attributes of his character - whether it be that he's good or evil, has special skills, has certain vices or virtues, etc. The mask also creates an air of mystery that intrigues the crowd and intimidates his opponents. Given that the mask does all this, to be unmasked is a big deal! To unmask an opponent is the ultimate victory for the winner and the ultimate humiliation for the loser. The unmasked luchador in effect gets cut down to size, loses his status as hero or villain, appearing only human and average, just like the rest of us. 4. How did lucha libre wrestling start and how long has lucha libre-style wrestling been going on in Mexico? One version of the story is that Don Salvador Lutteroth Gonzalez attended a wrestling match in Texas in 1929 and decided to bring the sport to Mexico. Things started off well enough, but it wasn't until the advent of television in the early 1950s that really launched the sport into the immensely popular and unique form of Mexican entertainment that it is today. 5. Who is the most famous luchador of all time? Who are some other famous luchadors? 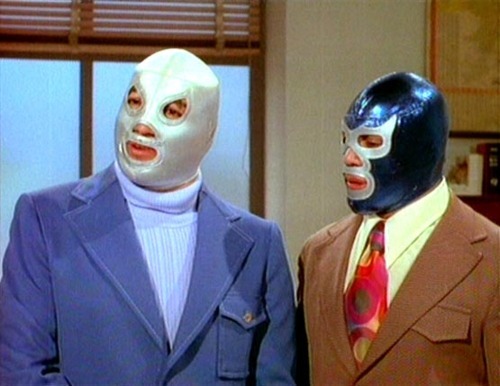 It seems pretty well agreed upon that El Santo (The Saint) is the biggest luchador of all time. Rodolfo Guzmán Huerta, the man beneath the mask, innovated constantly, adding many new moves that are now commonplace in lucha libre. He had a certain presence that endeared him to the crowds. 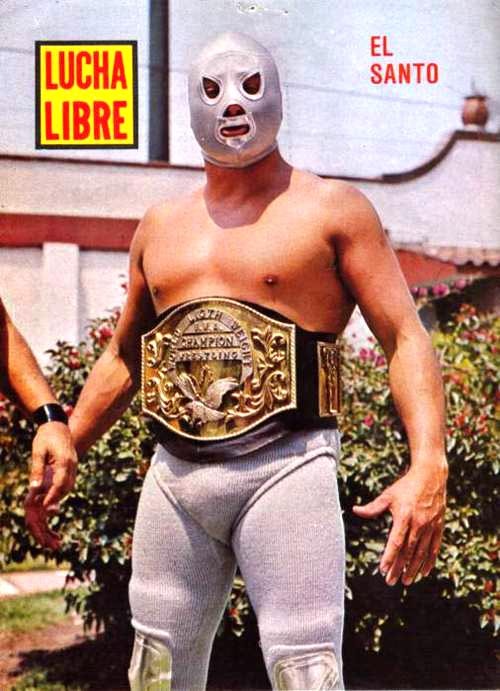 In the late 1950s he began starring in movies, further popularizing lucha libre and making him a superstar. Other classic luchadors: Blue Demon, Mil Mascaras, Rayo de Jalisco, Fuerza Guerrera, Perro Aguayo - really the list goes on and on. 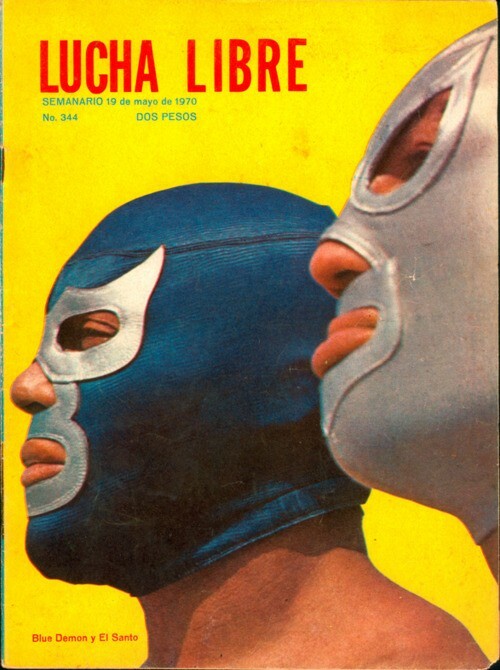 As lovers of retro kitsch, we're particularly fascinated by lucha libre in Mexican pop culture of the 50s and 60s, but of course, lucha libre is still huge today and only getting more popular! 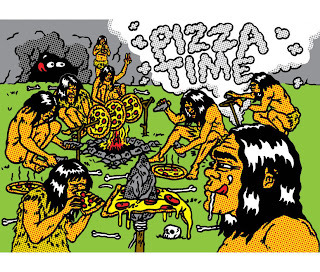 Happy New Year All-Pop customers and those who just happen to be dropping by. Welcome! Here's to a great 2012 for all of us. Happened across this artist the other day and had to blog about him. Jiro Bevis, check him out. This is an aesthetic I can relate to, lmao. There's definitely some sort of spiritual connection between his work and the sensibility behind All-Pop, even if it's not completely obvious. Enjoy!